MahaNakhon by Buro Ole Scheeren Group through HLS is the most significant complex of contemporary architecture and urban design in Thailand. As the city’s tallest building, the mixed-use space has brought together the best of metropolitan life - from culture to cuisine - in a dynamic civic environment. This freehold development is comprised of: MahaNakhon Square, a dramatic outdoor landscaped public plaza; MahaNakhon CUBE, a 10,000 square meter upscale retail centre with lush gardens and terraces spread over multiple levels for world-class restaurants, cafes and marketplace; The Ritz-Carlton Residences, Bangkok with 209 extraordinary apartments, each offering the atmosphere of a skybox penthouse, managed by The Ritz-Carlton Hotel Company with five-star amenities for all residents; Hotel and Observation Deck. 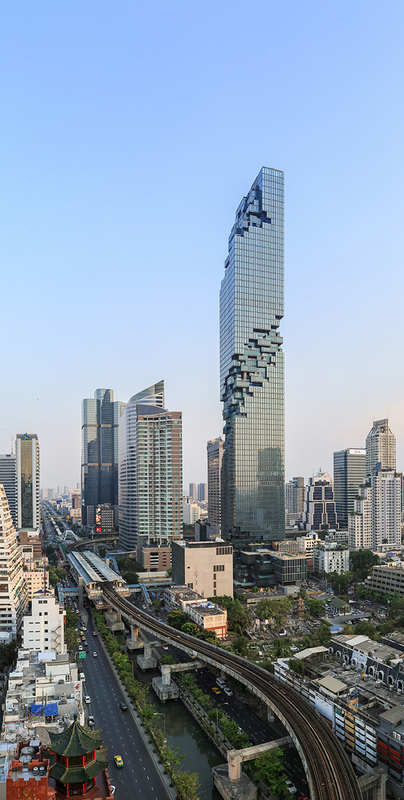 Construction of MahaNakhon is now completed, with the retail CUBE opened in 2014. Owners of The Ritz-Carlton Residences, Bangkok have already moved in to their residences and more residents are in the process of ownership transfers. Observation Deck and Hotel are scheduled to be completed by the 2018. In April 2018, parts of MahaNakhon development, namely MahaNakhon CUBE & Observatory, and The Hotel, were sold to King Power MahaNakhon Company.